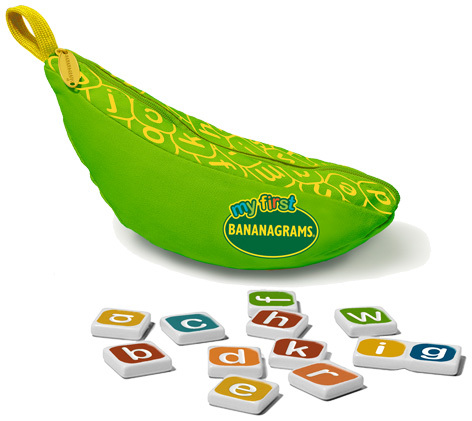 BANANGRAMS is one of those iconic games that seems to have been around for centuries. Never content to rest on their laurels however, the company that bears the same name as the game launched a new version for the junior members of the family. Called My First BANANAGRAMS, it’s suitable for children as young as 3 years old. The familiar yellow pouch has been cleverly given a new colour known as ‘ripening green’! The letter tiles have also been given new colours and for the first time include lower case letters. Instructions are included in the pack for ten mini games that are all curriculum based. These increasingly grow more difficult as the child’s ability progresses. My First BANANAGRAMS introduces kids to the vowels and consonants that they’ll be using all their life, and has huge educational benefits in teaching them how to spell and read. The zipped banana shaped case is perfect for storing the game letters when not in use. Apart from the BANANAGRAMS family of games, the company also makes Pairs in Pears, Zip-It, Appletters and Fruitominoes. Please tell us what you think of the My First Bananagrams by Bananagrams.